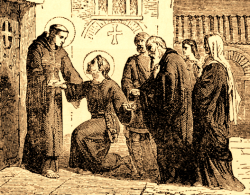 Saint Magloire, after his ordination, was first made Abbot of a monastery at Lanmeur. He governed that monastery with prudence and holiness for fifty-two years. When Saint Samson died, he was elected to replace him at Dol as its Abbot. Despite his hesitation, based on his sentiments of unworthiness and incapacity, he accepted, but remained for only two or three years; he was already septuagenarian. Then, with the consent of his people, he retired to a desert, where he built a cell. But soon his solitude was interrupted by souls who came seeking his prayers for their cure or deliverance from evil spirits. A wealthy man cured of leprosy, which had afflicted him for seven years, gave him at first half, then the entirety of the Island of Jersey, which was his property. There Saint Magloire built a new monastery, in which sixty-two religious served God, and in their arms he died a few years later. In the church he received the Viaticum from the hand of an Angel, and refused afterwards to leave it, repeating constantly the words of David, the royal psalmist: I have asked but one thing of the Lord, and will not cease to ask it of Him  that I may dwell in His house all the days of my life. Great miracles were effected at his tomb, placed in the same church. Do nothing out of contentiousness or out of vainglory, but in humility let each one regard the others as his superiors.